Here are the latest confirmed dates on Stevens European Blues Tour with more dates to be announced. ALSO we thank you from the bottom of our hearts for the thousands of kind messages and good wishes. Here is a video message from Steven himself this morning. 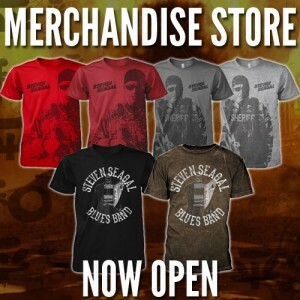 We are proud to announce the first ever Official Steven Seagal Merchandise Web Store which is open RIGHT NOW. Please click on the link below to go straight to the store. The store has new and exclusive items on sale immediately and we will be regularly adding new high quality items in the coming weeks. We hope you like the store, because as lifelong fans of Steven Seagal we feel it has sometimes been very difficult to buy quality merchandise and show support for our Film Hero BUT those days are now gone. Steven’s Blues Concert at the Sage in Gateshead, UK on the 18th July 2014 is now on sale from all major ticket outlets.